Replaces expensive, wasteful bottled water! Perfect RV water filter so water “on the road” is always good. Costs FAR LESS per gallon than pitchers, faucet mounts, and even other under-the-sink water filters while providing excellent contaminant reduction. Highest Flow Rate of any Under the Sink Filter! Large capacity means you install it and forget it! No more changing cartridge every 500 or 1000 gallons! No pesky low-flow extra faucet required. Plumb to regular faucet or dedicated high flow faucet. You choose. Sanitary Quick Change Cartridge means you can change it in only a minute and with NO TOOLS! Just shut off water, drain water from lines, twist; pull. Filters 15,000 Gallons of water! *Comes with non-corrosive mounting bracket, mounting screws, O-ring and lubricant, and installation instructions. Very ez Do-It-Yourself installation! The Perfect Alternative to Bottled Water! Healthy Drinking Water for about 2 Cents per Gallon! 1) Best Value on the Market: No other filter gives comes close to providing the water purification we provide for so little money! Cost are so low you’ll be happy to share with the pets and plants too! Click this “COMPARE” Button to see for yourself! 2) Highest Flow Rates on the Market: With a Flow Rate of 2.2 to 2.5 gallons of water per minute, Legacy allows you to fill those large cooking pots as fast as you would without a water filter. Our flow rate is 4 to 5 times the rate of other filters! 3) Reduces Chloramines too: 60% of municipal water systems are now using Chloramine in place of chlorine. The ANSI/NSF recommends you filter out chloramines from your water. Yet few water filters are engineered to deal with this contaminant. All Our Legacy Drinking Water Filters as well as our Contamin-Eater Whole House filters are tested to ANSI/NSF standards for the reduction of Chloramines. 4) Adapted to YOUR Needs: We offer options the other’s don’t! Do you need a High Capacity filter? We can filter up to 20,000 gallons. Do you want a filter for your RV or other equipment without a shut-off valve nearby? We have filters with shut-off valves and gauges built right in. Our Legacy filters are not only perfect for Under-the-Sink; they’re perfect for water coolers, RVs, or most any place you need purified water for drinking and cooking. 5) One full year of use before the first cartridge change: Having great tasting, healthy drinking water shouldn’t be a hobby! With Legacy you simply install it and forget it for a full year before you ever have to think about it again! With Capacities of 15,000 and 20,000 gallons, even the largest, busiest families have all the clean, healthy water they need for the year. 6) A Quarter Century of Satisfied Commercial Customers: Legacy was developed for the most demanding of restaurants and beverage producers – customers who can’t afford to take chances with the purity of their water. 7) Personal Small Business Customer Service combined with Big Business Innovations: ezClearwater is a small business serving the Residential and Office Markets, but all our water filters are manufactured by Selecto Scientific, Inc. – the Industry Leader in commercial filtration technology. Both Selecto and ezClearwater are dedicated to keeping our customers happy! 9) Made right here in the USA: No boatloads from China. No child labor. No cheap components. All our Water Filters are engineered, manufactured and inspected in Suwanee, Georgia, USA by trained technicians who really care about your water quality and satisfaction. 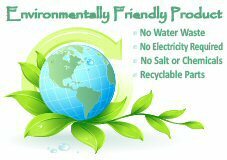 10) Environmental Protection: Protecting the communities where we live is a priority for both ezClearwater.com and Selecto Scientific, Inc. and goes into the design, production and distribution of our products. Ever part of our products and packaging is recyclable and it is our sincere desire that the end users of our products will recycle responsibly. All water filters have a specific life span after which bacteria can build up causing your water to be unsafe for drinking or bathing. Our Legacy under the sink water filters have media specifically engineered to kill harmful bacteria; providing one full year of protection for you and your family. To maintain optimal health and for your own personal safety, you need to replace the spent cartridge after one year of use. Patented molded Hollow Carbon with proprietary polymer & carbon fiber technology in radial flow in a high porosity molded block. This technology is state of the art in synthetic and natural high porosity carbon that allows the water to travel inside the structure of the carbon to achieve 20 times the kinetics vs. traditional carbon block. Standard 42 for Chlorine, Taste, Odors, Sediments at 2.5 gpm. Chemical reduction for taste improvement: Chlorine, chloramine, ammonia, hydrogen sulfite, metallic tastes. Class I Particulate reduction (removes particles greater than 1/2 micron in size). Products certified for reduction of VOCs under Standard 53 will be effective for all of the following contaminants, many of which can be categorized as Pesticides, Herbicides, or Insecticides.